Today I’d like to introduce a restaurant in Roppongi, “Hakata Gekijo“. well, some people might notice that the time went back since last blog which was about a day of cherry tree’s full bloom. The reason is my knee pain. My knee started to hurt since some days ago, and I became unable to walk (I can walk a little). I couldn’t go out to find stories for this week’s blog, and I remembered about today’s restaurant which I had visited one month ago which I hadn’t write about yet. The reason why I visited this “Hakata Gekijo” was that my junior colleague who had just lost a lot in Bitcoin trade in January wanted to visit there. I took him there to cheer him up. He earned a lot in last year’s Bitcoin jump, and he set profits in December. He set a buy position after New Year’s Day, but he could not check the market for a while because he was too busy for work. Then, the rate had crashed and he lost a lot. He has to pay big amount of tax for his big win, but he lost cash for it later. I was influenced by him, and I also started Bitcoin trade. However, I don’t have much money to spend on it, so I do margin trading which has good operational efficiency. As the price became maximum in December, I expected that it would decrease after a while. 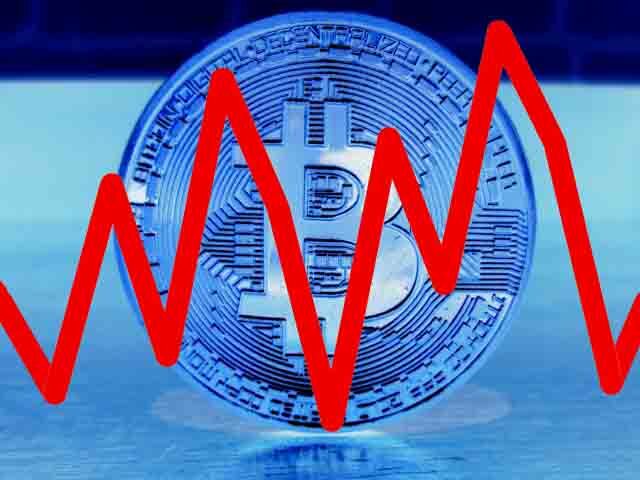 So I took a short position (oversold position, trading which create profit when Bitcoin’s price falls) with an easy mind and then, I made a profit of double of the amount I put. For such reasons, we arrived at “Hakata Gekijo”. 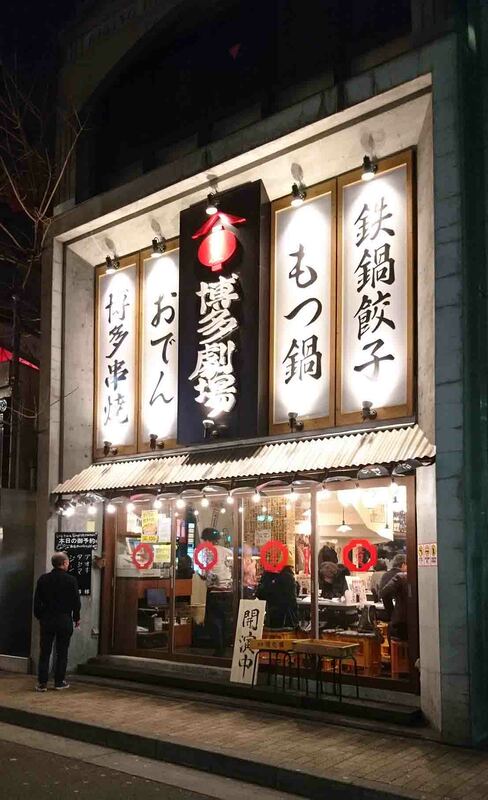 According to my colleague, this restaurant reproduces Hakata’s food stands. Talking about Hakata or Fukuoka, in my work place, if someone was ordered to move there, everyone envied the person (our customers were saying the same thing, but only men). I’ve only worked in the financial industry, so this might not apply to other companies. One of the reasons why people want to go to Hakata was that there were many good food stands there. I’d been wishing to try Hakata’s food stands one day hearing such stories at work, and this time, I happened to have the opportunity. It wasn’t a real food stand, so there were no trailers. But the atmosphere was casual like food stands. We ordered whisky and soda for the drink for toast, and then ordered foods. 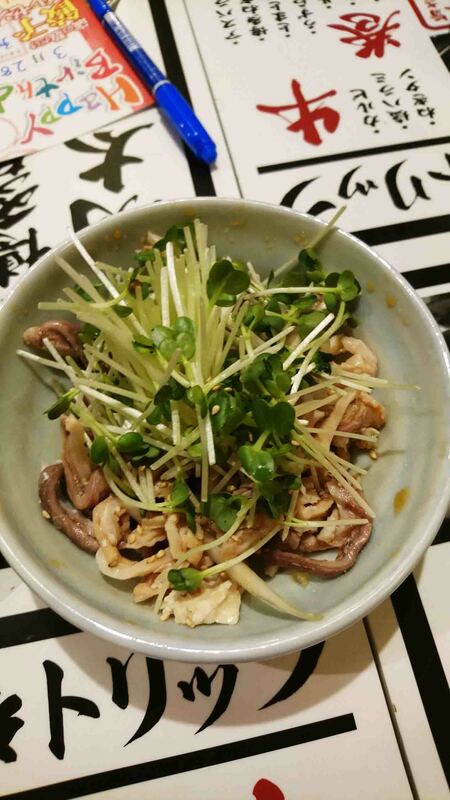 The first one was Sumotsu (entrails seasoned with Ponzu). The texture of Gatsu (gut, a type of entrails) and the flavor of Ponzu (Ponzu vinegar, sauce based on soy sauce and citrus juice) matched well. Low calorie was good as well. It was nice for the light snack to start. The next was “Popeye Salad“. I imagined from the name that it would be a spinach salad, and it was so. 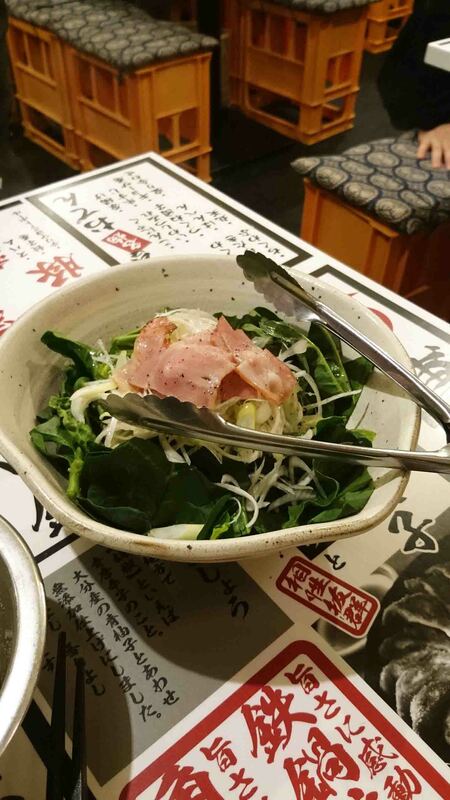 It is a normal spinach salad if you see the finished appearance. However, the cooking was finished at the table in front of us. 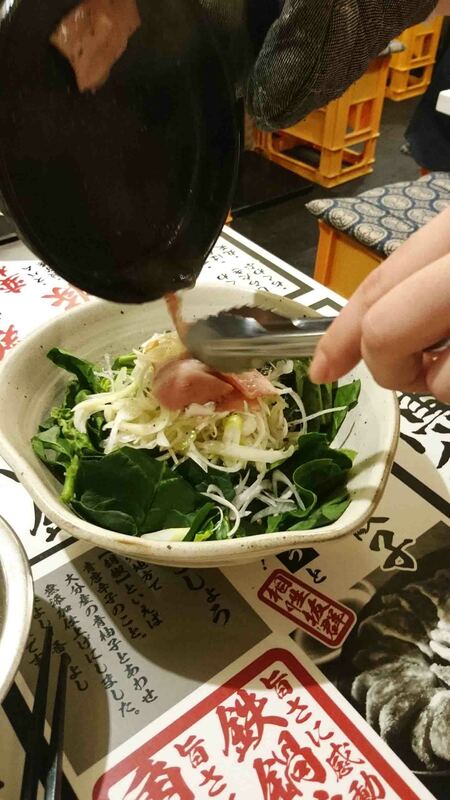 First, only spinach was brought to us, and the staff poured just-cooked bacon and hot dressing on it. The sound which the hot oil made when it touched the vegetable made the dish look even more delicious. Like a Japanese gourmet comic said, foods are enjoyed not only with your tongue, but also with all your five senses. The next one was this. Hitokuchi-gyoza (small gyoza) which looked very like “Hakata”. It’s one of the most famous foods of Hakata. The skin outside was crispy, and the inside was full of juicy filling. It was perfect with whisky and soda. 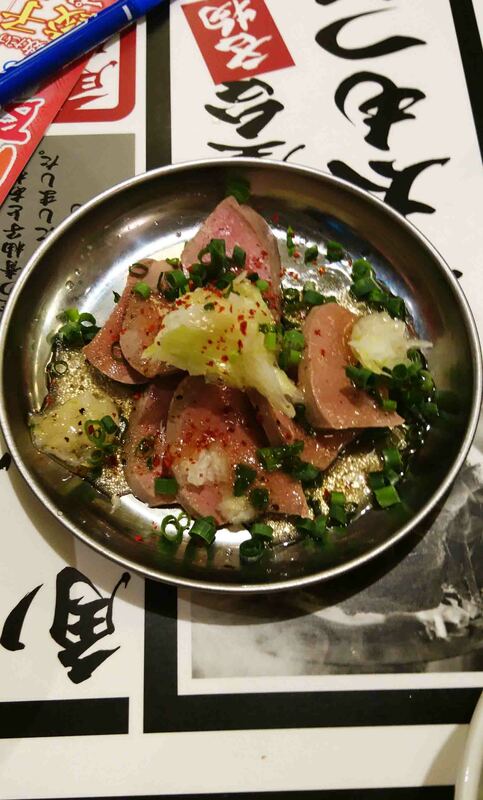 This dish was made by cooking the surface of raw liver, and seasoning with salt based sauce with spring onion. It was my first time to try this dish. It didn’t have bad smell of liver, and the texture was something between medium and rare. The sticky texture and the flavor of liver were nice. A Nihonshu must go with this dish! I thought so and ordered this sake. 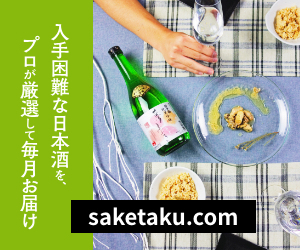 This sake is light and smooth, but it has deep flavor of Nihonshu if you taste carefully. Rebateki and this sake made the other’s flavor richer when they became together. Also, the sake cleaned up the aftertaste of liver from my mouth. I thought that they were a good combination. This sake is actually from Chiba, not Fukuoka. Some people might think that the restaurant should’ve served local sake, don’t they? I believe it’s no problem considering this perfect combination. In addition, the name “Umeichirin (a flower of plum)” was great for the day as it was early March, which is the season of plum flowers! Other than those foods, we also ordered other foods such as a blue mackerel and Mentaiko (salted and seasoned cod roe) potato salad, and everything was so nice. I had many foods even though I was on a diet. At last, I ordered this menu which I almost missed to order. 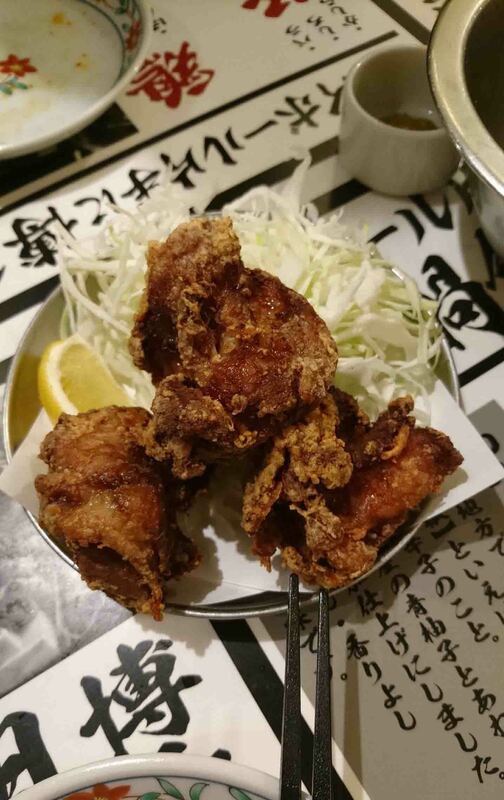 The one which I always order; Kara-age (Japanese deep fried chicken)! Their Kara-age had crispy coating and the juicy meat inside. The sauce was maybe ginger sauce. A type of Kara-age which I like. It made me feel like drink cold and light drink like beer or whisky and soda because of its seasoning and juiciness. The taste itself seemed to go well with Nihonshu as well, but I thought that light drinks would be better. I enjoyed Hakata’s taste a lot! Every dish was reasonable with good quality. The staffs were so active and bright, and they were creating a good atmosphere of the restaurant. 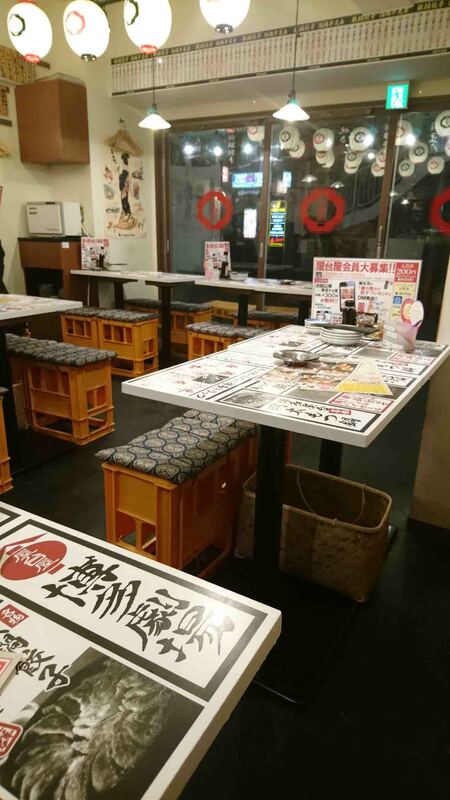 I had never been to real food stands in Hakata, but I thought that it should be fun like this restaurant. By the way, this restaurant has a membership system, and if you register the names through an app, you can receive free 100 pieces of gyoza (if my memory is correct) in your birthday month!! 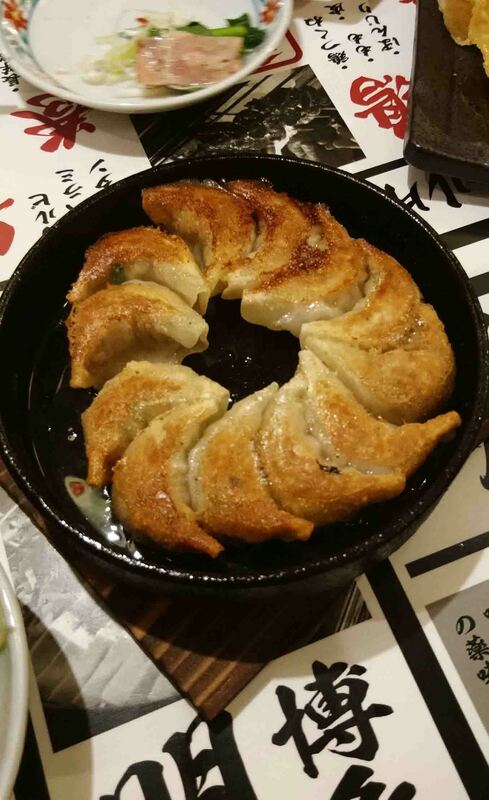 I was checking the app just now, and found that they sometimes hold an event of 100 pieces of gyoza for free if the participants can eat them all in 60 minutes (reservation required). From a customer’s point of view, I was impressed because they offer many valuable events. On the other hand, when I thought about it as a business consultant, I was a kind of surprised at the change in the management of restaurants. The visitors used to get stamps on a paper membership card to get the privileges, but now it’s recorded and supplied via apps. 11 years have passed since I started to work, and the frequency of eating out decreased for various reasons during the time. I felt that things had changed while I was away from the real scene. For now, usual apps’ main functions are the same things which the paper membership cards were doing, or just provision of information, so it’s not that innovative yet. But I think that the apps soon will have more breakthrough functions and most of restaurants will have their apps. To return to the topic, it was a nice meal of Hakata’s stand foods with “Umeichirin” in the season of Ume (plum). My colleague seemed also happy with the delicious foods. However, he still had a big damage in his wallet which couldn’t be filled up. The term of tax returns has finished, and now it’s the season of taxpayment. I wondered how he is doing while I was writing this article.